Today I found a fabulous idea! I can't find it again, but I wanted to share what I did because of it. If this is your idea, please let me know because I want to give you credit...I'll send you my entire folder. I made my own morning message boards for the entire school year. I changed the pictures so that each day of the week has a different picture and the pictures change monthly as well. I had to save it to .pdf file to keep the fonts. So...please give me some feedback. I'd like to open a TpT store, would this be something anyone would be interested in buying? Do you have an idea how much it might be worth? I did spend a few hours on it, but the user will have to make it her/his own to fit her/his needs. I will add more to my Morning Message when the school year starts and I know what will happen daily, weekly, etc. 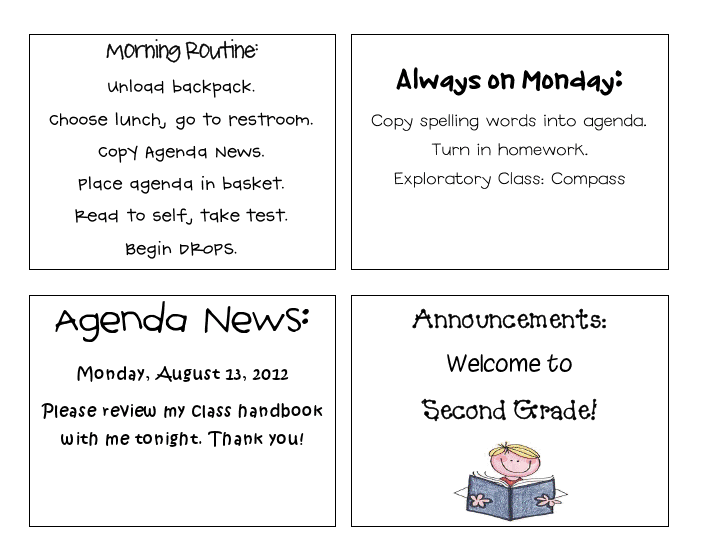 We have agendas and our students must copy agenda news each day. This is our form of parent contact on a daily basis. We do send newsletters on our homework (weekly contact) and a more in-depth newsletter bi-weekly or monthly. My team sends homework on Monday and it is due the following Monday so that the parents can help the children on the weekend if they have Wednesday night church, ballgames, dance, etc. I don't know what our Exploratory class will be on Monday, I just added Compass in as an example. I would love to look it over! 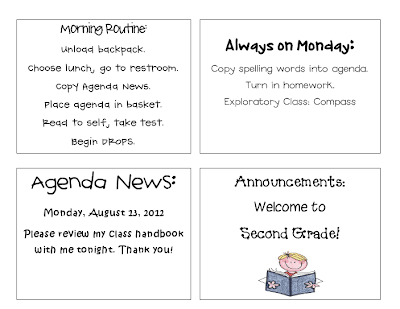 I have a Promethean Board and I do think something like this will make a difference in time spent. I do my morning message and meeting on my promethean board. I don't know if you stumbled on my blog or not and saw a post about it. I would love to look this over. I would love to look over it! I have a smartboard and this is a really great idea! Currently, One Extra Degree~Luna Camera Giveaway!